Some might say that when we swapped physical media for digital we swapped palpable material enjoyment for convenience. An oft-cited example is that of album art; once part-of-the-experience for music lovers, album art was said to be facing its demise in the world of playlists and attention-deficit track hopping. Turns out these concerns were wrong. Album art remains central to the digital music experience, and the reasons aren't just nostalgia or window-dressing; album artwork makes a music library more usable. It's well known that humans can more easily and readily recognise an image than textual data; their brains, tuned for pattern matching, can spot a familiar album cover with ease. So browsing for music is both more pleasant and easier with album art. 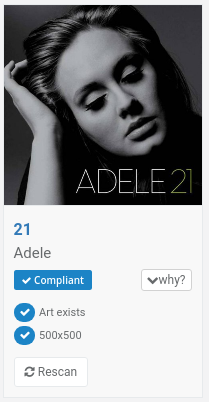 So album art is important; how do we make sure our Serviio music libraries are fully complemented? Turns out there are a wealth of software for doing this. I write one such tool, bliss. I first contacted Petr from Serviio a few years ago because we were both working on Synology plug ins for our software, then I suggested an article on each other's websites, because we have complementary users. So here I am, with a run through of using bliss to find missing artwork for your Serviio collection. In this case I'll install on Synology alongside Serviio, but the same instructions can be applied to the other supported platforms (Windows, macOS, Linux, Docker, QNAP and more). I'll skip over the detail here, I'll assume as I'm on the Serviio forum you've already got it installed! As both bliss and Serviio run on Synology, I'll use this NAS platform for the walkthrough; you can also install both products on other platforms. You can see the odd piece of artwork, but there's a lot of missing art too. That's where bliss comes in! bliss is installed from a manual SPK; you can download it from our Synology page. You can install it, and then I'd also strongly advise upgrading to the embedded version of the Java runtime if you haven't already done so for your Serviio install. All the instructions are on the page mentioned above. Click the settings cog at the top right to set bliss up. 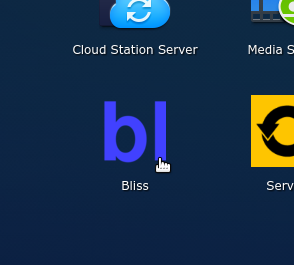 The folder that bliss monitors is pre-configured on Synology to the default Synology music folder. This needs to be the same folder that Serviio is serving from. Let's enable the cover art rule. Under Cover art click the ON/OFF button to enable cover art. When the cover art rule is enabled, bliss will automatically find and insert album art. It does this by checking if your artwork filename or embedded art exists. If neither exist, bliss looks it up online and installs it. Serviio is capable of serving artwork from local image files (which it prefers) or embedded art. Generally I recommend both be used for interoperability with other software. So, choose folder as the filename, and mark embedded art for installation. 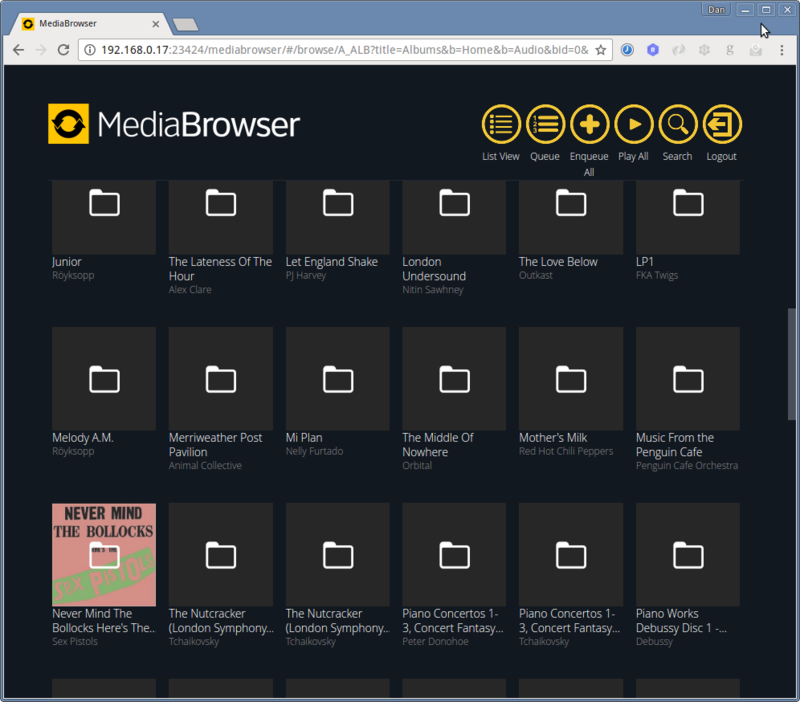 Note that Serviio resizes artwork to be compliant with the DLNA specification. This means 320x320 for clients that support it, but a quite low res 160x160 otherwise. As a result, you may want to specify a smaller maximum size for artwork to save on storage space, but like with storage options I would suggest allowing larger art for interoperability's sake (Serviio can always resize it). As bliss scans the files, they will show on the Albums page. Once bliss recognises these as albums, they will also begin to be assessed for album art compliance against the rules you set up on the settings page. 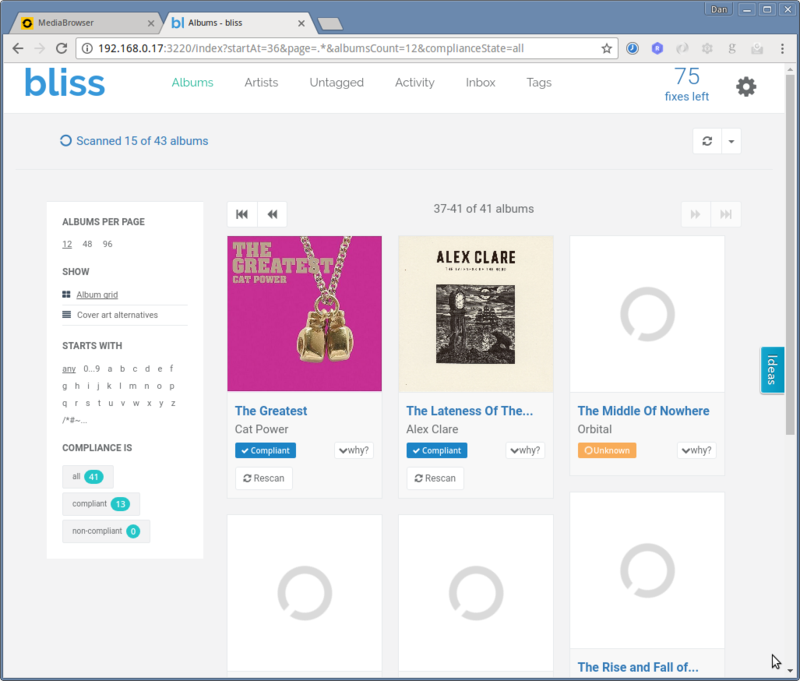 For those albums that were missing artwork, bliss will attempt to fill in the artwork automatically. Pro tip: on a low powered NAS it might be best to temporarily disable Seviio's Keep library automatically updated option, to avoid additional feedback loops between the two apps! If the art exists in a folder.jpg, say, but not embedded, bliss will use the folder.jpg and embed it inside the music files (and vice versa). Once bliss has completed its assessment of an album, and executed any fixes, it will be marked Compliant or Noncompliant according to whether the rules are now obeyed; namely the presence of album art (plus also sizing rules, if you specified these). You can also change the album art manually either via the album page (click the Edit button under the cover art), or the Cover art alternatives link. Once all your albums are scanned, it's time to go back to Serviio to make sure all that beautiful artwork is displayed! If you have Delta scan enabled in Serviio, Serviio should see the changes bliss has made automatically. If not, you'll need to kick off a Force refresh. Once completed, your library looks much more beautiful than before! bliss can also be used for checking tag accuracy, consolidating genres, resizing art, renaming files, padding track numbers and more! 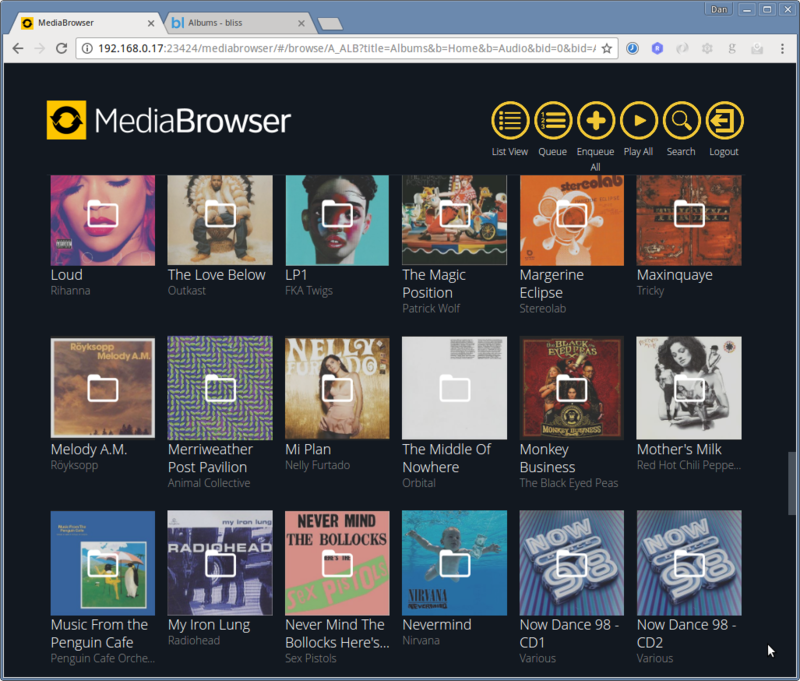 So give it a try and let me know what you think, and how this could additionally help with managing Serviio music libraries. I'll be monitoring this thread so do ask me any questions you have!